John Locke was an enlightenment-era philosopher who invented the concept of governmental checks and balances used in the United States' constitution. Leviathan provides a grim view of the world that justifies Monarchy; however, I am skeptical of completely unchecked absolutism. When it comes to Monarchy, I tend to agree with Locke's concept of checks and balances. I think that a Monarch should be kept in check by the aristocracy. I do not necessarily believe that absolute power corrupts absolutely; but a powerful aristocracy will, so to say, keep the king in check. In this sense, you a Hobbesian or a Lockian? Last edited by Abby Normal; Friday, May 21st, 2004 at 06:38 AM. Of the two I would choose Hobbes over Locke any day. For a Monarch to be worthy of the name, he must be considered to possess Divine Right. Otherwise he is somewhat emasculated. Once the concept of Divine Right is abrogated, then we have a Monarch only in name. In Britain, the victory of Parlaiment over the Crown meant the end for Divine Right and the installation of a 'constitutional democracy', where the Monarch is a mere 'head of state'. All true; but Divine Right is used to legitimate absolutism, and unless the Monarch in question is a particularly strong ruler (for example, Louis XIV), this is a dangerous system. Though I am, generally speaking, more of a 'Hobbesian' than a 'Lockeian,' Locke's theory of checks and balances would be fulfilled with the aristocracy keeping a Monarch's power in check. Of course, there is a delicate balance between awarding the aristocracy enough power and not enough; Louis XVI is an example of a tragic king who could not stand up to his Nobles. Moody; 'Divine Right' as a theory is really just a recent rationalisation of an ancient belief. Divine Right is not the result of some theory, rather the theory came much later. Once such a theory comes into being then the stage is set for a loss faith and a loss of nerve; it becomes 'just' a theory. When kings themselves start to doubt their own divinity then they give concessions to the commons and so weaken their own position [see the French and Russian revolutions]. Doubt is the great cancer that eats away at our kingdoms - doubt is the danger, not the divinity of Leaders. 'Checks and balances' to me is just another name for 'dilution of power'. Power is always absolute, for life IS will to power. Moody seems to adhere to an incorrect version of history. Monarchs have always had checks and balances on their power. This was especially true during the Middle Ages, where a King needed the contend with the church and the nobility to implement policies. Also in Kieven Rus, a Prince's power was not always absolute; often his power had to contend with the local veche, or assembly. This was especially true in Novgorod; where the veche often had more power than the prince. So the notion of checks and balances goes back a long way in how Monarchies operated. Also "divine right" does not equal "divine grace". "Divine grace" means that the monarch rules by the grace of god but must also operate within the law. This was the basic concept on which monarchies operated. It was only untill the Renaisance did the concept of "divine right" come about. "Divine right" means the King is only answerable to God and can rule however he sees fit. And I like to know where Moody gets his assertion about the Russian monarchy. LOL! And what concessions were those might I ask, specifically concerning the Russian monarchy. What the duma? You do realize the concept of the Duma has origins in Kieven Rus? You also realize and even extreme nationalists like the Black Hundreds called for a parliament like institution; although their ideal was more along the lines of the old Zemsky Sobor. And the Duma did not enhance the power of the Bolsheviks, for the Bolsheviks themselves rejected the Duma and even made them more militant. "The tsarist regime [in 1905] felt sufficiently threatened to offer a variety of concessions, which included an expansion of civil liberties". Absolute Monarchy requires absolutism; once you have a split between Church and Crown, for example, then you have a schism which heralds potential weakness. In pagan Rome the Emperor was sole ruler, both temporal and spiritual. 'Checks and balances' is an invention of the modern age and has no place in Absolutism; what were the checks and balances on the Emperor Augustus? To try and call tribal rivalries 'checks and balances' is a perversion of the latter notion. Of course there has always been power struggles - but that's not what's meant by 'checks and balances'. The latter refers to a system BUILT IN to the polity; example being 'the separation of powers' so beloved of the Americans! Any separation, or checks and balances just weakens. It is a misnomer to call the natural struggle of life 'checks and balances'. 'Divine Right' means that kings RULE by divine right of their birth alone; this does not allow for any separation of powers or checks and balances. One is either a monarchist, or one is not - I totally oppose any dilution of the Monarchical principle. And granting civil liberties is a bad thing? The Russian people had more freedoms under the Tsars than they would under the Bolsheviks. Indeed there was much in the way of "civil liberties"(as we would term it today) in old Kiev and Muscovy. Indeed the example of old Novgorod made the Magna Carta look like a "backward document" as Robert Wallace explained it. And also Moody, you still fail to see that the concept of a duma and such are not new but have origins in Russian political traditions. And the concept of the veche was later expanded to the whole nation with the Zemsky Sobor; which were first convened by Ivan III and Ivan IV. They were like a parliament, although not exactly in the way familiar to the British or other West Europeans. It sought to increase the bond between the autocratic Prince/Tsar and the common people. There were times (especially after the Time of Troubles) the Zemsky Sobor even voted on the successor to the throne and could veto candidates. And I said before, the notion of reviving the more democratic elements of Kieven/Muscovite autocracy was very popular among Russian nationalists. During the 19th century the Slavophiles were staunchly in favor of such a move. So were the Black Hundreds at the beginning of the 20th century. They were all staunch monarchists, but felt that the Petrine reforms had isolated the Tsar from the people. A Zemsky Sobor-like institution would help restore that close bond that was intregal to the Russian sense of national identity. So Nicholas felt himself as reviving a traditional Russian practice and institution. I like to know where I mentioned tribal rivalries as “checks and balances”. Divine right and absolutism are not essential elements of a monarchial system. Yes and I for one am a monarchist. But since Moody likes to fashion himself a NS, it’s interesting what Hitler had to say on this topic. And what were Hitler’s true political sympathies? Last edited by Taras Bulba; Friday, May 28th, 2004 at 07:19 AM. The question was [see first post] - are you Hobbesian or Lockian? The issues of Christianity and Russia are fairly marginal to that question. The Russian Revolution is just one important example I gave of a monarchy offering concessions to rebellious elements in the hope of buying off the rebels, only to find itself weakened and then over-thrown - the French Revolution is a similar case, a case that has been convincingly made. The issue is, do you believe in an Absolutist or a Limited Monarchy? 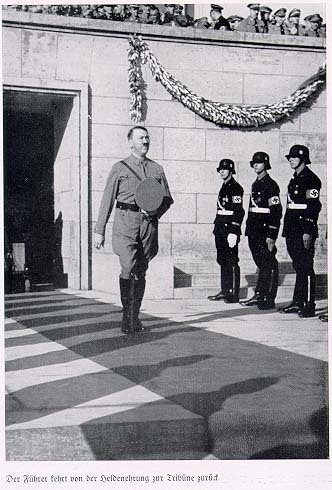 There are parallels between the Hitlerian concept of 'The Leadership Principle' and the general ideal of monarchy. As we are discussing Hobbes versus Locke, and therefore the issue of 'checks and balances', limitations on absolute power etc., it is clear that Hitler did much to do away with any pre-existing checks and balances and 'separations of power' in Germany. He banned the idea and reality of an 'opposition', and altered his job description and responsibilities from that of Chancellor to that of being the [total] Leader of the German Empire. So I think we can safely place Hitler on the side of absolutism. As to 'divine grace', this is a Medieval Christian notion. We are not SPECIFICALLY discussing Medieval Christianity here, so whereas 'divine right' could be used more generally to designate the concept that the sovereign [whether Tsar, Kaiser, Caesar, Emperor, Fuhrer, Duce, King or Pharoah] rules by the divine right of his birth, - the notion of 'grace' is particular to a specific kind of Christianity and is therefore irrelevant to the wider issue. Hitler - Hobbesian or Lockian? - what do you think! No they are not. The Christian concept of Divine grace had much to do with the issue of how monarchies are set up. As for Russia, you first brought that topic up, not me. Dont bring up a topic and then try to claim its marginal when you cant answer arguments raised against your remarks. Neither, I support the concept of Autocracy. "In what, however, is the essence of the religious idea of autocracy and by what is it distinct from absolutism? According to the ideology of autocracy, the tsar's might of rule is delegated not by the people, but by God. There does not exist the right to power, there exists but the obligation of power. The power of the tsar is altogether not an absolute, unlimited might of power. It is autocratic since that it does not derive from the will of the people and is not limited by the people. But it is limited by the Church and by Christian truth, spiritually it is subordinated to the Church, it is a service not in accord with its own will, but rather the will of God. The tsar ought not to seek his own will, he ought to serve the will of God. The tsar and the people have a common bond between them with one and the same faith, with one and the same submission to the Church and God's righteous truth. Autocracy presupposes a broad basis of the people's social support, but living its life independently, meaning that it is not bestown by the life of the people. Autocracy is justified in only this instance, if the people have evident a faith, sanctioning the power of the tsar. It cannot be an external coercion by force over the people. Peter the Great was insufficiently Orthodox, and his inclinations towards Protestantism rendered him an absolute, and not autocratic, monarch. Absolute monarchy is a by-product of humanism. In absolutism, in imperialism, the tsar is a delegate of the people, supreme power does not belong to the tsar, although there does belong to him an absolute and unlimited power of governance. But the people can also take away the power of the tsar. Suchlike is the idea of the absolute monarchy, as worked out in the West. 13 In absolutism the tsar is not manifestly a servant of the Church. The subordination of church to state is a characteristic mark of the absolute monarchy. And thus also it was with the Catholic Church under Louis XIV. Absolutism likewise always developes a bureaucracy and chokes the social life of the people. L. Tikhomirov has thus expressed for us in purest form the idea of the religious grounds of autocracy....But has here existed at some time in history the religious autocracy in its pure, its idealistic form? L. Tikhomirov himself is compelled to acknowledge, that there was not. In Byzantium the religious idea of autocracy was always distorted by the pagan Roman absolutism and in it the imperial power did not possess a popular social basis. All the Peterburg period of Russian history is the triumph of absolutism and bureaucratism, the stifling of the independence of the Church and the independence of the life of the people. The closest to the religious idea of autocracy was in pre-Petrine Rus'. But even there it is impossible to find those features, which are sketched out in the religious idea of autocracy. Ivan the Terrible was of a very prominent and consistent expression of the Russian idea of autocracy, but this at once evokes also distress and doubts. In the West ultimately there was nothing similar to autocracy, nor indeed could it be begotten upon a Catholic soil. Instead, a struggle between the spiritual and secular powers transpired there. It is clear, that the religious and Orthodox idea of autocracy, of a sacred monarchy, is purely an utopia of a perfect and ideal civil and social order, the same sort of utopia, as is a papal theocracy, as is any perfect ideal socialist order. A beautiful utopia, perhaps the finest of utopias! But in fact autocracy always transformed itself into absolutism, and was absolutism. Both Byzantium and Russia, two great Orthodox monarchies, did not manifest themselves as types of a religious autocracy. Imperialism triumphs in every great monarchy, it is the destiny of the monarchy, which draws it both to greatness and to ruin. Of the pagan imperialistic idea no monarchy lacks for, since monarchy by its very nature is of a pagan origin. In but the short instant that monarchy becomes Orthodox, it then quickly developes the pagan principle of a world ruler, of the earthly kingdom of Caesar." --Nikolai Berdyaev "The Kingdom of God and the Kingdom of Caesar"
Im in favor of autocracy, not absolutism nor limited monarchy. Dear Pushkin, may I suggest that you continually limit your perspective to the Christian period only, and that you have a seeming obsession with Russia? I mentioned the Bolshevik revolution and regicide only in passing, and as an example, among others, in order to illustrate how concessions and LIMITATIONS doom a monarchy. The latter is the TOPIC of this thread - the Russian revolution was mentioned merely as an EXAMPLE, and NOT therefore as a "topic" [make a new thread on it if you wish]. When in doubt of what the topic is, refer to the thread's title and first post. I have already answered that I prefer Hobbes to Locke - how about you? Pushkin; "Monarchy by its very nature is of a pagan origin"